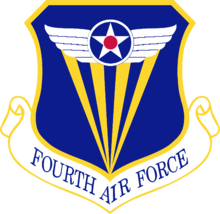 The Fourth Air Force (4 AF) is a numbered air force of the Air Force Reserve Command (AFRC). 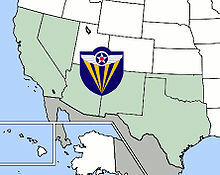 It is headquartered at March Air Reserve Base, California. 4 AF directs the activities and supervises the training of more than 30,000 Air Force Reservists. If called to active duty, 4 AF's ready reserve units would be assigned to Air Mobility Command, Air Education and Training Command, and Pacific Air Forces. Fourth Air Force flying units include one unit-equipped air mobility and two unit-equipped airlift wings, five unit-equipped air refueling wings, three associate air mobility wings, two associate airlift wings and one associate air refueling wing. Since the end of the Cold War, Fourth Air Force has supported humanitarian missions such as Provide Promise in the Balkans and Provide Relief and Restore Hope in Somalia. Units rushed to provide aid and rescue service to the residents of Florida, the Gulf Coast, and the Caribbean in the aftermath of the traumatic and prolonged 1995 hurricane season. It supported immediate assistance to aid victims and disaster officials following the bombing of the Oklahoma City Federal Building. Fourth Air Force units provided assistance for several natural disasters, including the 1994 Northridge earthquake in the Los Angeles area, and the catastrophic midwest floods and the California wildfires in 1993. In 2003 Fourth Air Force became an intermediate echelon responsible primarily for all Air Mobility Command (AMC) gained AFRC air refueling units in the United States and AMC gained AFRC strategic airlift units in the western United States. Today the sixty person staff consists of Traditional Reservists, Air Reserve Technicians and civilian employees. They direct the activities and supervise the equipping and training of more than 30,000 Air Force reservists in unit programs located across the continental United States, Alaska, Hawaii and Guam. Reservists from 4 AF units were routinely deployed to Air Expeditionary units in combat areas of Afghanistan and Iraq as part of the "war on terror".